THE COVE – United Methodist Center, 2131 Camino del Rio South, Mission Valley (adjacent to the First United Methodist Church of San Diego), exit I-8 at Texas Stree. There is ample free parking. Michael Stanley Dukakis was born in Brookline, Massachusetts on November 3, 1933. His parents, Panos and Euterpe (Boukis) Dukakis both emigrated from Greece to the mill cities of Lowell and Haverhill, Massachusetts before marrying and settling down in the town of Brookline, just outside Boston. 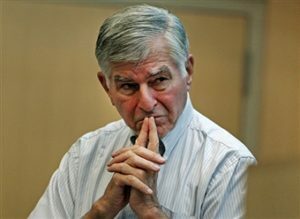 Dukakis graduated from Brookline High School (1951), Swarthmore College (1955), and Harvard Law School (1960). He served for two years in the United States Army, sixteen months of which he spent with the support group to the United Nations delegation to the Military Armistice Commission in Panmunjom, Korea. Mike and Kitty Dukakis have three children: John, Andrea and Kara, and seven grandchildren – Alexandra Jane Dukakis, Harry Nicholas Hereford, Josephine Katharine Hereford, Olivia Dukakis Onek, Peter Antonio Dukakis, Nora Dukakis Onek, and Sofia Elena Dukakis.